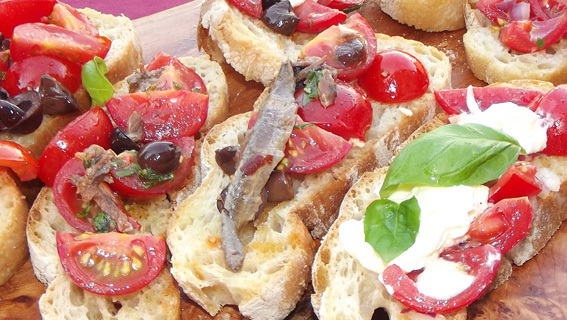 The origin of bruschetta dates back to 15. century. It consists of toasted bread rubbed with garlic and topped with olive oil, salt and black pepper. Chopped tomatoes, prawns, anchovy fillets, olives, chopped fresh basil , oregano, etc. 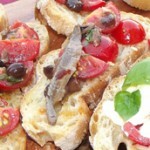 Simply slice ciabatta bread and place into pre-heated oven for 4 minutes or until crunchy. Then remove from the oven rub both sides with an open clove of garlic and drizzle with extra virgin olive oil and top with your selection of toppings. You can also put it back into oven for a couple of minutes if you like the bruschetta warm. If you do barbecue, place the bread on the grill and then top with your toppings. Ideally, you should use very red, ripe plum tomatoes and season with salt and black pepper.